UNC Health Care has chosen a location for UNC Hospitals’ planned Surgical Tower project: directly in front of the NC Memorial Hospital. When the tower is complete it will provide patients and families with easier access to surgical services and create a more modern façade at the front of NC Memorial Hospital. UNC leaders are in the early stages of planning a six-story, 150,000-sq. ft. tower that will house a substantial portion of the surgery and related services offered at the medical center. 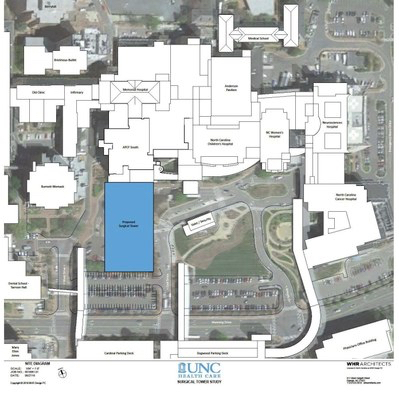 The project has an estimated $177 million budget, though final details are in flux, UNC Health Care reported in a news release. The new surgical tower would be built directly in front of Memorial, becoming one of the main faces of the campus as patients and their families drive to the hospital or walk across the foot bridge that connects the hospital buildings to the parking deck. To fund the project, UNC Hospitals has received approvals from the General Assembly and UNC Board of Governors to borrow as much as $250 million by selling bonds later this year. UNC Health Care executives first considered the back of Memorial Hospital for the new tower, though that would have posed a considerable impediment to operations. So executives decided to locate the new tower in the front of the hospital instead. There are no current plans for additional operating room licenses in Orange County, so any operating room UNC wants to put in the new tower would mean it has to shutter an existing operating room. Separately, the state has determined a need for another 41 beds in Orange County next year, and UNC Health Care will almost certainly apply for those beds, Triangle Business Journal has reported. In addition, UNC Hospitals just received regulatory approval for a $100 million project to renovate the main campus and add to the Hillsborough campus. This project will add 29 acute care beds and bring UNC Hospitals’ to 890 licensed acute care beds. The surgical tower will replace aging facilities with larger, modern operating suites and associated support services. The existing operating rooms, built in the 1950s, are small by modern standards, especially for complex cases that require larger teams of surgeons and other specialists. The new facility will enable physicians to treat patients more efficiently.